Literary Classics: Leaving Kent State earns the Literary Classics Seal of Approval. Leaving Kent State earns the Literary Classics Seal of Approval. May 4, 1970 was a pivotal day in the history of America as National Guardsmen opened fire on un-armed student protestors at Kent State University, killing four and wounding nine. But beneath the newspaper clippings and the news-reels were real stories of genuine people who were personally connected to this infamous day in U.S. History. Seventeen-year-old Rachel anxiously awaits the return of her friend and neighbor, Evan who is fighting in Vietnam. But when he comes back, he is a shell of the man he once was. Theirs is a poignant love story that intertwines seamlessly with the historically accurate backdrop of an iconic moment in history. 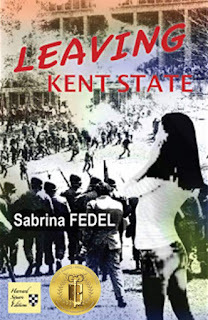 Leaving Kent State, by Sabrina Fedel, is a work of fiction that transports readers to Kent, Ohio in the 1960s. Rachel is a powerful narrator as she relates the hopes, dreams and fears of a young teenaged girl in love growing up at a time of civil unrest and turmoil. Expertly crafted, and skillfully penned, Leaving Kent State is recommended for home and school libraries and has earned the Literary Classics Seal of Approval.